Nike React Vapor Street Flyknit-skoen til mænd tager det løbeklare Flyknit fra Vaporfly Elite og kombinerer det med ultraresponsivt Nike React-stødabsorbering under foden. Resultatet er en livsstilssko med et hurtigt look og plys, robust stødabsorbering til forbedret dagligdagsbrug. The extremely tall soles, because of their narrowness combined with the mesh fabric create some stability issues. It sometimes feels as though your heel is slipping off the edge of the sole. Since they're for leisure use only, it's not that big an issue, but I would never run in them. On the plus side, the shoes look great. 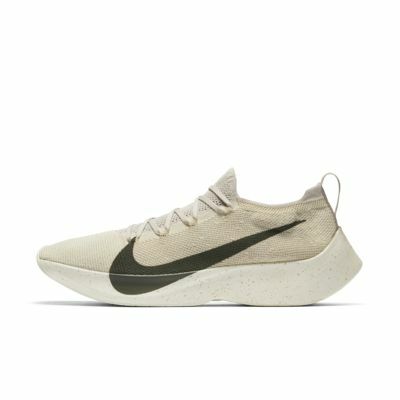 This shoe looks like its from the future. They're even better in hand. The flyknit here is of a completely new material here. It is more durable, less stretchy, and has a rubber texture to it. It's different and I like it better than the regular ones. It is stretchy at the tongue so it still forms to your feet. This shoe is only a hyperfuse heel cup away from being an actual running shoe. I don't know why they went for a lifestyle version. It is cushioned well, zero fatigue after long wears, it is narrow but the flywire helps my flat feet stay in shape. Only gripe is the rubber on the heel. It is miles better than the epic react but mine are starting to show slight wear. This is a great everyday shoe that just screams speed and could maybe do a short run if you're not serious about it. A must have trainer as they are the most comfortable ones ever. I absolutely love these trainers as they are the most comfortable ones I have ever worn. They have become the shoes I turn to most days. I would say they are mainly for summer as the knit make them breathable so your feet can feel cold if it’s cold outside. I just hope they widen the range and colours especially as these shoes never seem to be on stock now.